Fresh off a stint on Chopped Champions, Bagatelle’s chef Andrew Ricatelli is currently spending his days and nights tuning into the New York City seasons, imbuing the restaurant’s summery French Riviera vibes with a few more warming spices and wintery notes. While he may spend his nights with poulet rôti and steak au poivre, at his core, there lies a love for the bright cacophony of flavors found in Vietnamese cooking. I was the executive sous-chef at [Spice Market by Jean-Georges] for a couple years, and we had a banh mi on the menu that was one of my favorite things. We'd get the bread delivered from a Chinese bakery every day. It was just a really great sandwich. I'm drawn to the flavors that create that base of umami—fish sauce and ferments and kimchi and shrimp paste, all of it. So many of those foods and techniques were formed out of necessity, and it brings me back to the way I grew up cooking with my grandmother, who was from Hungary. I felt at home with those techniques, so I immersed myself in it and haven't looked back since. [The banh mi] is the easiest vehicle to get all those flavors in; the spice and the salt, the sweet, the meaty. It's all in one. Share Ricatelli’s love for a well-crafted banh mi? 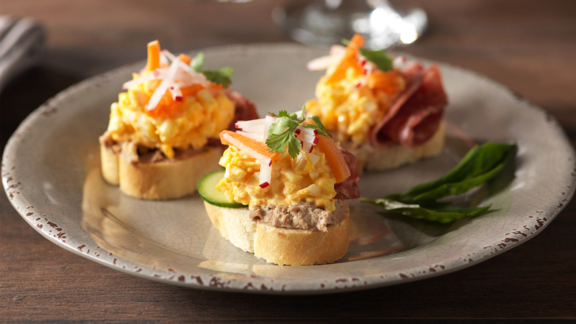 Check out this take from our partners at The American Egg Board, where a fluffy scramble takes center stage among bright pops of jalapeno and pickled vegetables. To see their full treasure trove of chef-created recipes, click here! 1. Julienne the cucumber and carrots. Place in non-reactive bowl. 2. Blend fish sauce, rice vinegar, lime juice, 1 tbs. warm water, sugar, red pepper flakes, ginger and garlic; reserve. 3. Separate the stems from cilantro leaves. Reserve cilantro leaves for garnish. Mince the stems; add to the julienned vegetables. Pour on fish sauce blend; toss to marinate. 4. Blend mayonnaise and Sriracha sauce; cover and reserve. 5. Split baguettes in half; toast in 400° F oven for 5 minutes. 6. In sauté pan, cook and scramble eggs in butter in small batches until firm throughout with no visible liquid egg remaining. 7. Spread spicy mayonnaise mixture on both cut sides of a toasted baguette. Top half of bread with 1/3 to 1/2 cup each eggs and drained vegetable slaw. Sprinkle on 2 tablespoons cilantro leaves and 2-3 strips jalapeño. Cover with baguette tops. Serve immediately.